For those that are like me and can never find instruction manuals. 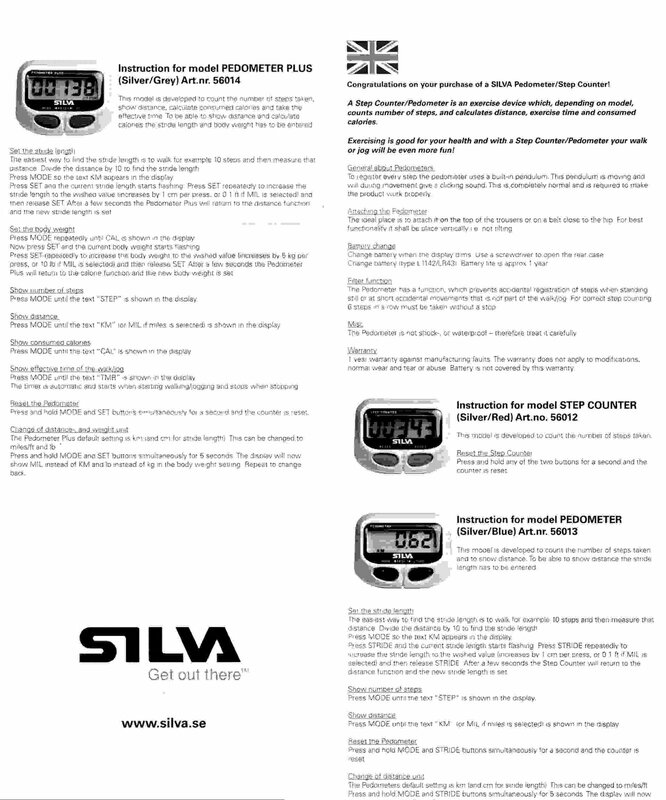 Here is the setup sheet for the Silva Step Counter (56012) , Pedometer (56013) and Pedometer Plus (56014). 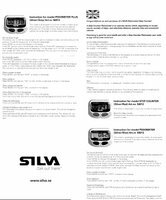 Click on the image to get the full size. I’m now on my third one. The internal pendulum seems to only last a million steps, which for me is about a years walking or a stroll down The Camino from SJPP to Santiago de Compostella. Always attach to your belt with a lanyard (latest models have a small hole to thread a cord through). If they get wet, the displays stops working. However, they still count OK – just put near a radiator and the display will start up again. Previous PostBloggers BrunchedNext PostEbay hot properties. How expensive is this model? I have a pedometer, but it measures 3 miles for every 3.75 miles on a treadmill, inexplicably. It’s a little odd. Thanks for stopping by my site Geoff. This is a brand new world to me. Thanks to Geoff for this. His tip about the lanyard is especially good! I lost mine in dense jungle once, and only found it by getting the dog to locate with his nose which must have taken some luck as I had no way of telling him what I was looking for. I guess he is used to finding things with my scent on them!! You’re a star putting the manuals here, my mum’s really pleased she could reprogramme hers now after losing the manual. Pleased that it has helped you 🙂 I have given up using them now as the Fitbit is a lot more powerful etc. Its a pedometer on steroids.